SAME HAT! : LAST PUSH: VOTE TOKYO ZOMBIE! 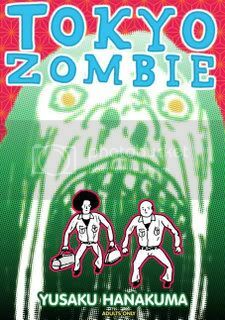 If you have 30 seconds, please vote Tokyo Zombie in the the About.com 2008 Readers Poll: Best New One-Shot Manga. With polls about to close on Sunday, it looks like Tokyo Zombie is slightly trailing the leader, "Seduce Me After The Show." I would be okay losing to Disappearance Diary or Tatsumi's Good Bye, but not this book! PS: In other news, I'm at home with a debilitating migraine, goddammit. I'm finishing up a few more posts by tomorrow afternoon, barring my skull case breaking open and evil spiked worms burrowing out of my brain! I just voted, and Tokyo Zombie is leading by 5 votes!! Dang, that was fast! It was down by 7 when I posted this :) You guys are awesome! Nice- You guys are awesome. I feel like Dumbledore with my own little army. Oh god, too dorky that reference was. Hope I'll be able to check Tokyo Zombie one day. Here also from argentina my vote! !Hanakuma for president!! shirley and seduce after the show,just only seeing the cover it seems to be holy crap!! ps: and as always keep this place bizarre and cool!! Urgh, How has Disappearnce Diary received so few votes? it was super amazing? congratulations to you and the same hat! readers. Tokyo Zombie won in the Best New One-Shot Manga category: enjoy! congrats, and thanks for voting!